To connect eCC with Shopify, select the Shopify store from the online store dropdown. Then enter your Shopify store URL in the store URL field. For example, if your store name is www.webgilitystore.myshopify.com, then you should only enter “webgilitystore” in the field in eCC. Click on the Get access token. Note: If you get an error while attempting to get the access token, click the box below and paste the url into your browser. This will manually retrieve the access token. 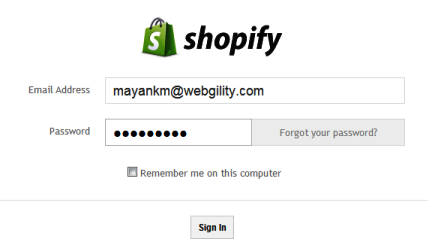 Login with the details to your Shopify store. Click install in the prompt in the window. Click 'get access token'. 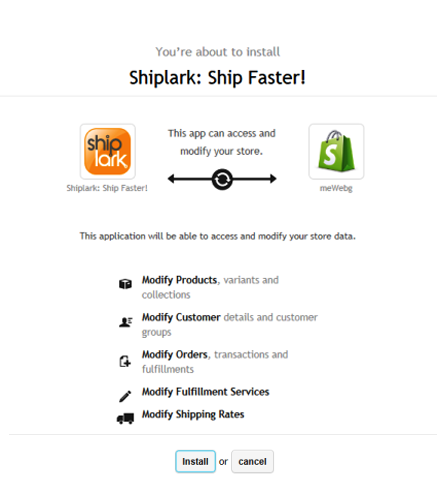 Once successfully connected, Shiplark will begin downloading the data and setting from your Shopify store. Store address should be the "from" address that you are going to be shipped from.The local date format is formatted for United States format, if you are utilizing a different format in your location, that can be selected here. A company logo can be added that will be seen on the packing slip used in shiplark. While connecting to QuickBooks, select the version you need to connect, select the company file location. Click on connect to QuickBooks to move to the next step. Remember, before you click on connect to QuickBooks, you need to have your company file open in single user and admin mode. eCC will download data and settings from QuickBooks and Click to Continue. Enter the company data file name. Select POS version and POS server computer name. The POS Server computer name can be obtained by going to my compter in Windows and clicking properties. The Computer Name displayed there, would be the same as the POS Server computer name. Click continue to proceed. You are now ready to process orders, so you should click "Let's Go" to proceed to the dashboard. For Detailed Settings can be configured after you proceed to the dashboard and your orders have been downloaded. This can be done by opening eCC and going to File >> Configure Stores.